Woke up without the aid of an alarm clock (7am); got 9 hours of sleep. Made gluten-free buckwheat pancakes, in honor of my sister-in-law, Jenny. Steve walked 20 miles, overnight in Boston on Saturday, as a participant of The Overnight, to help raise awareness for suicide. Jenny took her own life, nearly four years ago. One of the many fabulous things about her was that she was gluten-intolerant, which encouraged the rest of us to seek more variety when cooking holiday meals. Weeded most of the vegetable garden. Discovered that even fewer tomato plants have survived. Have space to plant some radishes & kale. Went to the salon & got some red back into my hair. Had fun with Jane, Colleen, and Spatula the dog, there. Ran a few shopping errands, at a leisurely pace. So, meandered the errands? Got first of many messages from Steve, indicating that his flight home would be delayed. Started to feel a little sad that I wouldn’t spend as much of my day off with him. 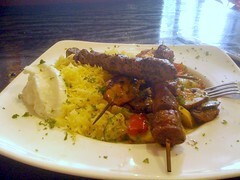 Stopped for lunch at Shish; enjoyed the “Kebab Trio,” and took home a slice of Red Velvet Cake, for later. On the way there, noticed a new business, just down the street. The typesetting and business name gave me a chuckle. Did some laundry, started preparing a short rib ragù dish (a Giada recipe). Started to put together my yoga resumé, should I decide to apply for the CorePower Internship. After thinking all day that a home yoga session would be ideal, decided to head to the studio, for heat, energy, and companionship. Also, my unlimited monthly membership ends soon, and I want to squeeze in as many classes as I can before it ends. Enjoyed the sequence that Linda took us through: lots of hip openers. It was a great time of day, for that, for me. Enjoyed some wine, brownies, and sorbet, with neighbors across the street. Enjoyed some shot rib ragù (yes, in that order). Felt that my nutrition karma ended up intact, as the dish was topped with semisweet chocolate shavings. Watched two more episodes of True Blood. Figured, I’m going to be up late, anyway. At 12:15am, went to airport and picked up my weary but fantastic husband. He’d spent over 13 hours in the Boston airport. So, most of the day was very restorative, but in the end I ended up with a sleep deficit. Ah well. Ça roule. It was still worth it.